There are two options we want to note right now when it comes to reversing the effects of baldness and restoring a fuller head of hair. One option involves using solutions that will thicken your existing hair, making bald patches less apparent. The other option involves regrowth of new, natural-looking hair in patches that are now bald. At our Boston, New Jersey, and New York City hair transplant surgery centers, we are often asked which option would be best for a given patient. The answer, as you may have already guessed, is that it depends. Let’s look at these two options and what they both have to offer. Hair thickening involves various agents being applied to the hair to increase the thickness of the individual strands of hair. This may be accomplished through certain shampoos or topical solutions applied to the hair itself. The appearance of thickness can also be achieved by dying your hair a darker color. This can help reduce the appearance of thinning hair and help conceal some bald patches. The other option involves promoting hair regrowth in parts of the scalp that are currently without hair. 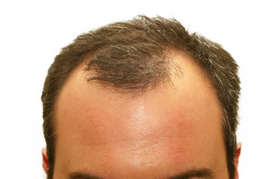 This can be done through the use of Rogaine and Propecia, both of which also have thickening effects. A sure way to promote hair growth in an area without hair currently is to undergo a hair transplant surgery. This will place viable hair follicles into that particular part of the scalp which will then grow new and natural hair in that area. Determining which option is best for you will depends on a number of factors. If you have hair that is thin or thinning and have not experienced pronounced hair loss, hair thickening may be a better option for you than a hair regrowth surgery or treatment. Now, if you have noticeable bald spots due to male pattern baldness or female hair loss, hair regrowth would be a better solution, Whatever the case, we do encourage you to visit us for a consultation so we can give you our expert opinion on the matter. To learn more about hair regrowth, hair thickening, and the many other methods that can address baldness, contact our New York City hair transplant surgery and restoration centers today.